Though this may shock most of us in the developed world, half the world still cooks with wood, coal, or animal dung. These people living in developing countries have no access to electricity or gas and need some means to cook food and boil water. For those using firewood, they face numerous hardships and dangers. According to the World Health Organization (WHO), they have to walk over 10 miles and spend over 30 hours a week to collect wood, spend up to 35% of their income on purchasing fuel, and expose themselves to harm and smoke the equivalent of 40 cigarettes a day just to cook. In Africa, for example, women walk up to 15 miles each trip to find wood for cooking, often carrying loads of 40 to 60 pounds under extreme conditions, plus deforesting already strained environments. Clearly, a solution lies in a better stove. The World Food Program has turned to a small nonprofit organization called Aprovecho, which isn’t developing rocket science but rather a simple but household appliance called the rocket stove. In a rustic research center near the railroad tracks in Cottage Grove, Oregon, Aprovecho builds stoves that use minimal amounts of wood, don’t release much smoke, and are cheap enough for the developing world. The stove Damon Ogle, a retired mining engineer, helps build can cook rice for 20 people with two fistfuls of sticks — up to 90 percent less wood than required by a traditional cooking fire. Though lab tests to date show a wide variety in the performance of rocket stoves, there is no doubt of their advantages over open fire stoves. Studies by USAID, Berkeley Air, and Columbia University found a consistent 40% reduction in fuel use as compared to traditional stoves. 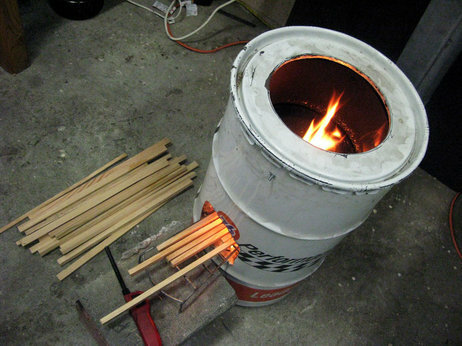 Aprovecho’s lab in Cottage Grove, Ore., has a rocket stove design built from a 55-gallon oil drum (Image: Aprovecho). The origin of the rocket stove lies in a man named Larry Winiarski, who has a Ph.D. in mechanical engineering. In 1982, he had recently lost his wife in a traffic accident, and had quit his job with the EPA to stay home in Oregon and raise his kids. The rocket stove Winiarski invented in the 1980s is the prototype for Aprovecho’s current crop of clean, efficient stoves, and his 10 principles have become the catechism for good stove design around the world. Today, Dr. Larry Winiarski is the Technical Director of Aprovecho and he continues improving the design. Since 1982, over 10,000 designs based on Rocket Stove principles have been introduced into over 30 developing countries on five continents. These can be divided into locally produced rocket stoves and commercial stoves imported from developed nations. Among the latter, both international institutions and commercial companies have shown interest. On the international scale, the UN has shown interest. The health and environmental damage posed by cook stoves received global attention with the launch of the Global Alliance for Clean Cook Stoves at the 65th session of the UN General Assembly in New York. The former Secretary of State Hillary Clinton announced that the Alliance would supply 100 million homes in developing countries with cleaner stoves over the next ten years. The Alliance is a partnership between the Clinton Global Initiative, the UN Foundation and the private sector. The Global Alliance for Clean Cook stoves has raised $158 million to help develop, market, and distribute clean-burning stoves, some of which are of the rocket stove type. Championed by celebrities such as Julia Roberts, the initiative is ramping up in Bangladesh, China, Ghana, Kenya, Nigeria and Uganda. Other less well-funded nonprofits are also taking the initiative. For instance, The Paradigm Project is on a mission to distribute over 5 million fuel-efficient and cleaner-burning rocket stoves to women all over the world. The commercial industry is also showing growing interest. Bryan Wilson, a professor of mechanical engineering at Colorado State University and a founder of Envirofit, says that there’s a global need for 500 or 600 million rocket stoves. His company mass-produces rocket stoves in China for export to places such as rural India. Armed with $25 million in financing, Envirofit will be managing the Shell Foundation’s Breathing Space program, which was launched in 2002 to achieve significant reductions in indoor air pollution. Colorado State University’s Engines and Energy Conversion Laboratory is partner to help Envirofit design, develop, market, and distribute 10 million clean-burning these cook stoves. Youth volunteers from the cook stove project in Kenya, aged between 18 and 32 years, have already trained around 16,000 local women, on the benefits of the new cook stoves and how to install them in their homes (Image: UNEP). Not all developing countries are waiting for the big players to help them. Some of them are helping themselves. 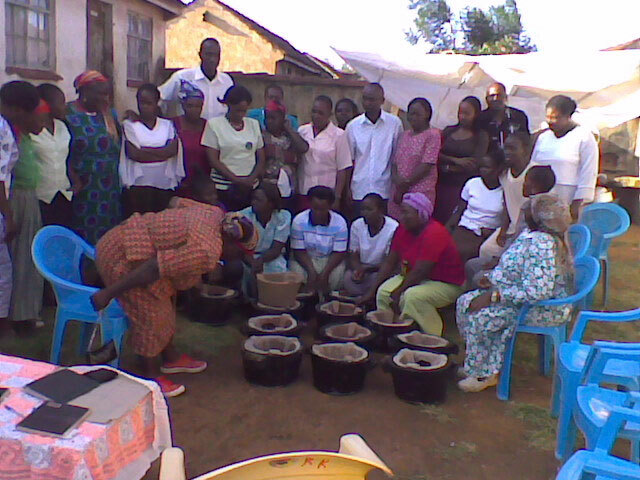 A successful example of locally produced stoves is in Kenya. The Jiko Poa rocket stoves there features an abrasion and thermal shock resistant ceramic liner surrounded by a precision cut, sheet metal cladding, demonstrating a 43% fuel savings as compared to an open fire. It also equates to $280 in savings, 33 trees saved, 1,300 hours of time saved, and a smoke reduction of 60%. Youth volunteers from the cook stove project, aged between 18 and 32 years, have already trained around 16,000 local women, on the benefits of the new cook stoves and how to install them in their homes. To date over 3,000 cleaner stoves have been produced and sold by Rural Youth Community Empowerment Program (RYCEP), and installed by women’s groups across Kenya. “Young people look for things that can direct them,” said Peter, who started RYCEP initially to raise awareness about HIV-AIDS. Today, the group’s volunteers, who are mostly secondary school students, organize road-shows and concerts to spread the word not only about HIV-AIDs but also about the benefits of cleaner cook stoves. Other locations are also prevalent. In Uganda, Aprovecho is implementing a Rocket Stove suitable for the large-scale cooking needs of institutions. In Honduras, Aprovecho, Trees, Water and People, and AHDESA, are developing micro-enterprise by training artisans and vendors to build and sell Rocket Stoves. Thanks to these international and local efforts in spreading the use of rocket stoves, the lives of the other 50% of the world is improving. There remains much work that need to be done. It’s hard to believe that such a common home appliance in the developed nations can improve the life expectancy, reduce deforestation, and save significant time and effort in the other half of the world.